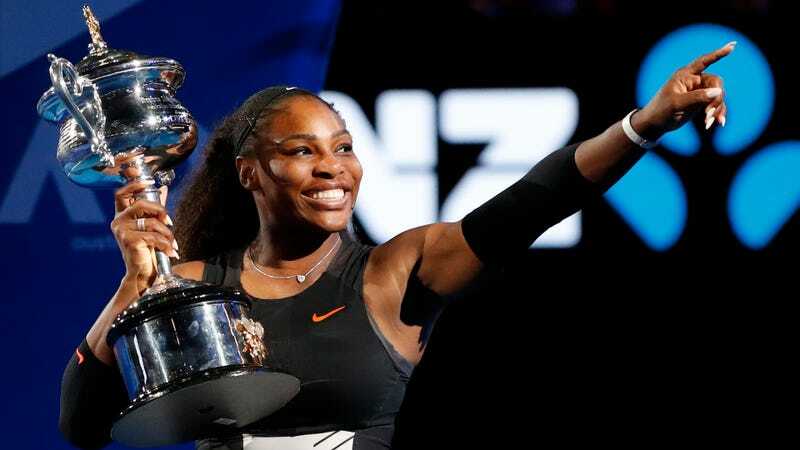 In terms of what it actually was, Serena Williams’s Australian Open victory was fairly straightforward; in terms of what it means, it’s totally overwhelming. Serena defeated sister Venus Williams in straight sets today, her seventh Australian Open championship. After a rocky start to the match—four straight breaks of serve, plus Serena breaking a racket in frustration—the younger Williams got into a rhythm to win 6-4, 6-4. The tennis itself, then, wasn’t too far from what everyone expected from this finals pairing. But the weight of everything that comes with it is kind of astounding. It’s Serena’s 23rd major, the most in the Open Era and only one behind the all-time record set by Margaret Court in 1973. It allowed her, now 35, to break her own record for the oldest woman to win a major. It gave her back the No. 1 world ranking that she lost last September. It, essentially, should be enough to shut the door on any lingering questions of whether or not Serena is truly the greatest. She is. Her victory speech was full of gratitude for Venus, whose appearance in the final was notable in its right. With her first major final since 2009—and only her second time past the quarterfinals since 2010—Venus became the second-oldest Grand Slam singles finalist in the Open Era at 36.